Version 2.1.2 of Xenon UI (and the Redux version) is now available, which should work much better with Library GUI. Thanks for the report, gizmo! Version 2.1.3 is now available which should fix this issue. Currently using the latest version of Xenon UI (released today) along with Resource Pack G and the latest version of The Library. Decided to catch up on some history about this OXP and noticed something odd. Regardless of the version used in the past or am using now never have had the image of My Ship in the upper right quadrant of the initial F5 screen. This is not something that mattered in the past but now having read this entire thread and the Wiki entry and having seen all of the screenshots that include a Commander's Ship in that position it feels as if something is missing from my game. The only time (aside from external views) that My Ship is visible to me is from the Load Commander Screen which just no longer seems to be enough. If it helps My Ship is currently outfitted with one of gsagostinho's Cobra Mk. III textures. 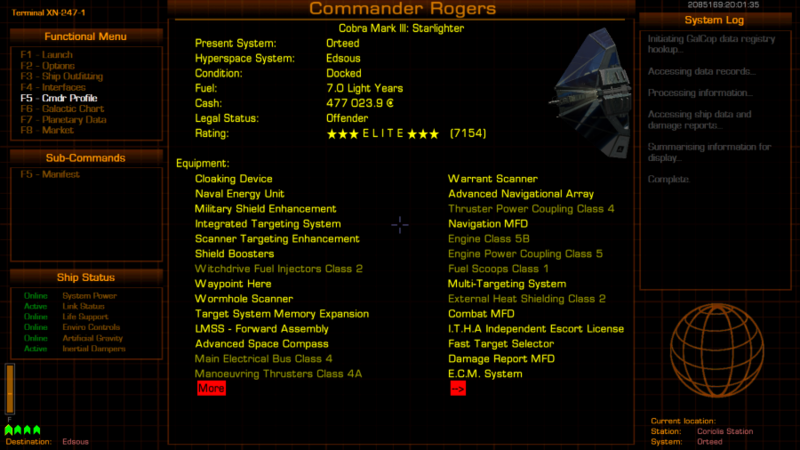 Looked through the Xenon UI code but did not notice anything specifically relating to the showing of a Commander's Ship on the F5 screen. If it is a matter of adding some code somewhere to accomplish this then that should be doable if the specific code was known to me. Please advise and Thank You in advance. Add "show-ship-model-in-status-screen" = YES; to your .GNUstepDefaults file (back it up first, perhaps). That should do it. Is there a reason that this option is not listed on the .GNUstepDefaults Hidden Options Page on the Wiki? Other than the fact that no one has placed it there because it is such common knowledge to all but the newest of players. Would have found it sooner on my own if it had been there. Is there a further option to prevent My Ship from spinning on the F5 screen? Admittedly this one is pushing it a bit but hey, it cannot hurt to ask. Will stop derailing the thread now. Thank You Once Again. Nite Owl wrote: Is there a reason that this option is not listed on the .GNUstepDefaults Hidden Options Page on the Wiki? No idea, but it does now! All the resource packs have been updated as well, and because of this new option they have all doubled in size (sorry!). But I think the option is worth it. The effect is best seen with the latest Trunk version of Oolite, which has a new option to allow the color settings in the "gui-settings.plist" file to be changed via JS. This means the page header and underline colors can be changed to match the background whenever you switch. If you aren't using trunk, the colors will stay as blue. If there's any call for it, I might release a small pack that will force the amber colors on the header for users of 1.86 and prior. Same option has been added to the Redux pack. Norby wrote: Nice and dangerous. I'd be happy to settle for just Competant, at this stage. A bit of a conflict has arisen between Xenon UI v3.0 and Library v1.7. The Latest Log keeps filling up with the following errors. Version 3.1 is now available which corrects the compatibility issue with Library 1.7. Fast bug smashing. Thank you very much phkb. One day it will all make sense - Maybe - Maybe Not. @phkb: Sorry about the extra work. I just forgot to send you a pm about the locked defaults.